Rose chafers are commonly found in many areas, particularly those with sandy soil. They are pests on many different types of flowers, fruits, trees and shrubs but they are especially damaging to young, developing rosebuds, grapes and cherries. Rose chafer feed on the foliage of many trees, shrubs, also blackberry, grape, raspberry, strawberry, and tree fruit such as apple, and cherry. Also garden vegetables, and ornamentals such as birch, dahlia, hollyhock, iris, peony, poppy and rose. An adult rose chafer is a moderate-sized beetle, 1/3 – 3/4 inch (8-19mm) long, with wing covers having small yellowish hairs. It’s slender and can be pale green to tan in colour with reddish-brown or orangish spiny legs, and the body is black on the underside. Larvae are small white grubs with a brown head that are found in the soil. Rose chafer larvae overwinter in the soil and pupate in the spring. Adults emerge in late May to early June. Because the rose chafer prefers sandy soil to lay eggs, plants located on sandy sites are most likely to the attacked. 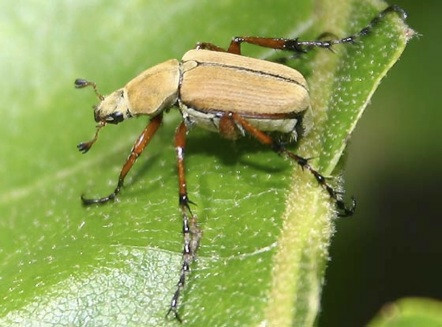 Adult beetles feed on plants for three or four weeks, generally until late June. Females lay eggs in groups of 6 to 25 in the soil among the weeds and grasses until early July, and then die shortly afterwards. Eggs hatch in about two weeks, and larvae feed on the roots until fall, then burrow deeper into the soil to spend the winter in the soil below the frost line. They pupate the following spring and then emerge as adults. There is one generation a year. Adult rose chafers chew on flowers, especially roses and peonies, causing large, irregular holes by eating the leaf of the tissue between the large veins, a type of injury known as skeletonizing. They also chew on leaves, and fruits, but are usually damaging only when exceptionally numerous. Damage is more sever in areas with sandy soil. Larvae feed on roots of grass and weeds doing little noticeable damage. Prevention: Gardeners should regularly monitor their gardens starting in late May, especially if you have a history of rose chafer infestations. Cover smaller plants with Floating Row Covers until July. Cultivation destroys eggs and pupae in the soil. It is especially effective against pupae if cultivating is continued into early June. If large numbers of chafers are around, drench the soil with insect parasitic nematodes to kill the larvae. When small numbers are present, hand pick to remove rose chafers. Put them into pails of soapy water to kill them. Because rose chafers are good fliers, more can fly into your garden and you will need to check your plants routinely for any additional rose chafers.